Last night I was working. Part of my job is posting on the library’s Facebook and Twitter accounts, so I get to spend time reading bookish things all over the Internet. Yeah, I know. Rough gig. Now I get paid for doing all the slacking off web browsing that would have been frowned upon at my old job. So I spent way too long laughing at Lisa Simpson’s book club. I also came across this interview with Charlaine Harris at Shelf Awareness (you have to scroll down nearly to the end) in my Internet travels. I think it’s fun to know what my favorite authors are reading. I especially love it when they have active Goodreads accounts. I love hearing about what others are reading or their favorite books, so I decided to post my own responses to the Shelf Awareness questions. 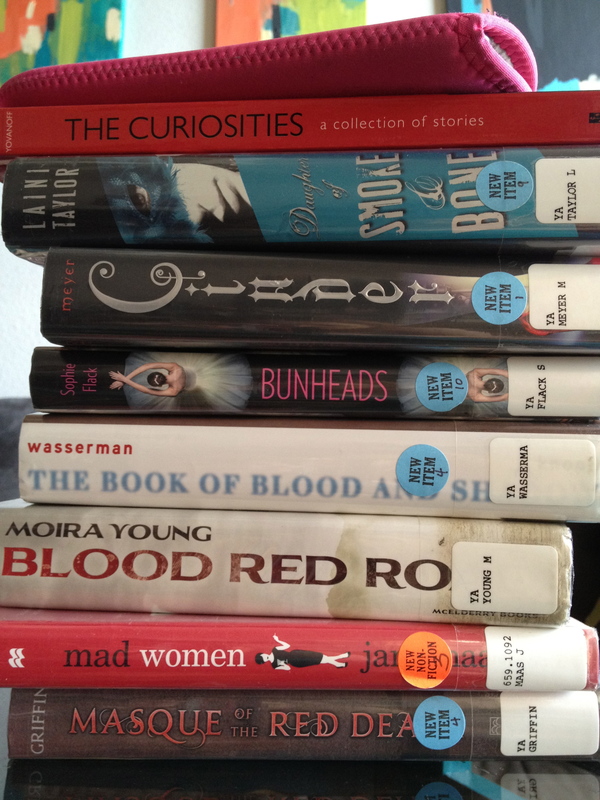 I read a lot of young adult these days, since I’m working in that section of the library and am doing teen programming. My nightstand reflects that! I read about 3 books a week since I’ve started working at the library so this should get me through the rest of the month. This one is supposed to be a futuristic steampunkish dystopian loosely based on Edgar Allen Poe’s short story. I like to read a nonfiction book once a month, and I’m excited to check out this Mad Men inspired look at women working in advertising. This one came highly recommended by the other YA librarian. It’s a Hunger Games read-alike but intended for a slightly younger audience. This one is a mystery about a manuscript, and supposedly well-written. I’ve seen it compared to The Book Thief and The Da Vinci Code. I love ballet (we even have season tickets). I really wanted to be a ballerina when I was younger, but am cursed with poor coordination and a curvy, un-ballerina-like body and lack of grace. But I still love the world. I first heard about this book through an interview with the author on NPR. CInderella as a cyborg. This book has had a lot of buzz. I had to check it out. Laini Taylor has pink hair and writes gorgeous prose. This is the one I’m in the middle of right now. It’s about angels and demons and wishes made from teeth. It’s set in Prague. There’s a coffeeshop with coffins for tables and Roman statues wearing gas masks. The library got this as an ARC (one of the authors lives in my town). These short stories grew out of a free writing flash fiction challenge between these three popular fantasy and paranormal YA authors who blog as the Merry Sisters of Fate. What I find so cool about it is that they’ve all written notes about their process and drawn funny pictures around the margins, and it’s all part of the book. I’ve got a ton of reading for my Kindle, too. Mister BS is astounded at how little Vonnegut I’ve read and is insisting I work through his collection. This one is so hard. My grandmother gave me the Little House books as a Christmas gift when I was 7 or 8, and I grew up nestled between the Flint Hills and the Kaw River Valley, so they are very much a part of my childhood experience. I got in trouble for reading them underneath my desk during class in second grade. That was so difficult to narrow down, so I just had to type without thinking. Jane Eyre. I was supposed to read it for a class on major women writers in college and I just never could get past the very beginning when Jane is still a child. I’ve never even met Mr. Rochester. I was really busy that part of the semester and got sidetracked and ended up totally faking it by reading analysis of it and paying attention during class discussion. Some day I hope I’m able to finish it, but every time I try…I just can’t get into it. Gosh, so many. I’ve been pushing The Miseducation of Cameron Post by Emily Danforth on anyone who will listen to me. I also am in love with Sandinista from The Sharp Time by Mary O’Connell. 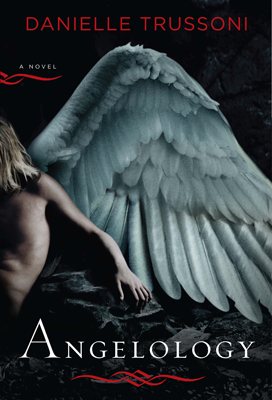 And I just finished Graceling by Kristin Cashore and think I might have liked it better than The Hunger Games. Gender and War by Joshua Goldstein. This academic treatise on the connection between violence and gender changed the way I think about the world (and my future educational and career goals) when I read it in college. I am sure I’d have a different answer for this every time, but this is what it is today: “While I am dreaming, I am hoping,” which is Mikhail Gorbachev, quoted in Lenin’s Tomb by David Remnick. Still Life With Woodpecker by Tom Robbins. I bought it on a whim in high school because the cover features a woodpecker and a pack of Camel cigarettes, and that night a group of my friends were all snowed in at my house. We stayed up all night reading it aloud. It was magical. What’s on your nightstand or your answer to any of the other questions? I happened to see that ad just last night as my family was watching harry Potter on ABC Family at the bar last night (that is how we roll). The book isn’t really that good and I imagine they’d have to develop an entirely new plot to sustain a weekly television show.